Thanks to eldritchhobbit for commenting about the deliciousness of eggplant, I decided to try another eggplant recipe. The stuffed eggplant recipe in The Essential Cookbook calls for a large eggplant. As I could only find small and medium-sized eggplants, I used two eggplants. Although this was a good quantity for two people, it wasn't enough to use all the stuffing. 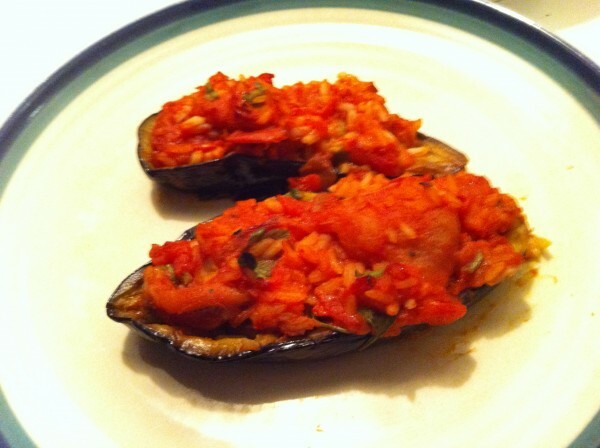 As you can see, the eggplant is stuffed with a mix of rice, tomato, eggplant, and herbs. It's tasty, but you really do need a large eggplant or two with all the rice and tomato called for in the recipe. I used the rest of the stuffing in a baked egg dish. And with this recipe, I come to the end of The Essential Cookbook. Most of the recipes that I tried were pretty good, with a few becoming favorites. Many recipes made ample quantities, leaving me with lots of left-overs. One of the first recipes that I tried, however, was pretty bad. And to find all those good recipes, I had to weed through many recipes that didn't interest me. So, in the end, I will give up this cookbook. Oh wow… thanks for posting this. Can’t wait to try this out!